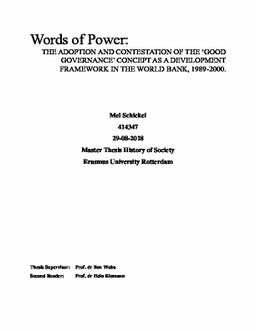 Erasmus University Thesis Repository: Words of Power: THE ADOPTION AND CONTESTATION OF THE ‘GOOD GOVERNANCE’ CONCEPT AS A DEVELOPMENT FRAMEWORK IN THE WORLD BANK, 1989-2000. Words of Power: THE ADOPTION AND CONTESTATION OF THE ‘GOOD GOVERNANCE’ CONCEPT AS A DEVELOPMENT FRAMEWORK IN THE WORLD BANK, 1989-2000. This master thesis presents an alternative narrative on the concept of good governance in the period 1989 - 2000. By opening up the black box that is the World Bank through using automated text analysis techniques on all documents published by the Bank in the period, the research focusses on the internal mechanisms that formed meanings behind the concept. Employing theories of contextual meaning, the four distinct meanings of good governance were identified. Three meanings can be traced back towards different interpretations of development, while the fourth represents a context in which the World Bank operates most often. The research shows that good governance constituted as a mode for policy innovation within the World Bank, away from market-oriented development knowledge towards poverty alleviation. Even though all four meanings of good governance were present from the start, their usage represents struggles in power relations between the World Bank’s management, executive directors, and staff. Unlike other secondary literature, this thesis underwrites the importance of institutional constraints and aspirations in the formulation of development knowledge. By not approaching the Bank as a unitary actor, the clash of conflicting interests and conviction within the institution have been exposed. In this analysis, the often touted the depoliticising language of the World Bank does not constitute as a rhetorical tool aimed outward but is rather a symptom of policy innovation within an institutional discourse. Concretely, the staff’s language was not formed by the constraints in the form of the Articles of Agreement but by the market-oriented orientations imposed by higher management during the 1980s. In the same manner, it can be concluded that in the period 1993 – 1996, the management attempted to steer the meaning of the concept towards a more political interpretation of development. This was most likely done in reaction to external pressure. With its four meanings and vague definition, good governance was the encompassing concept that gave a name to this development within the Bank. The reason why good governance was used in the period of 1989 – 2000 can be found in the recognisability of the concept and the broadness of its meaning, allowing anyone to use aspects of the concept to fit their agenda.